The Champlain Bikeway circles around the entire Lake and along the Richelieu River in Quebec on mostly paved rural roads. Connecting theme loops, ranging in distance from 10 to 47 miles in length, follow both paved and unpaved roads. Paved alternates for unpaved sections are not offered for theme loops. Two bridges and four ferry crossings are reasonably spaced along the length of the Lake, creating a number of options for day trips. Bicyclists are discovering some of the finest cycling in North America along a 1,300+ mile network of bicycle routes, known as Lake Champlain Bikeways, in the Lake Champlain Valley of Vermont, New York, and Québec. The network includes a total of 35 loops and tours ranging from 10 to 60 miles in length, in addition to the Champlain Bikeway. Click here to get the revised version of the Champlain Bikeways map as a PDF. Several changes in the basic route have been made to reflect current road and traffic conditions. Having the map in an electronic format will allow us to update it more frequently as conditions changes. It is not available in paper form at this time. The Champlain Bikeway also has a network of connecting theme loops. 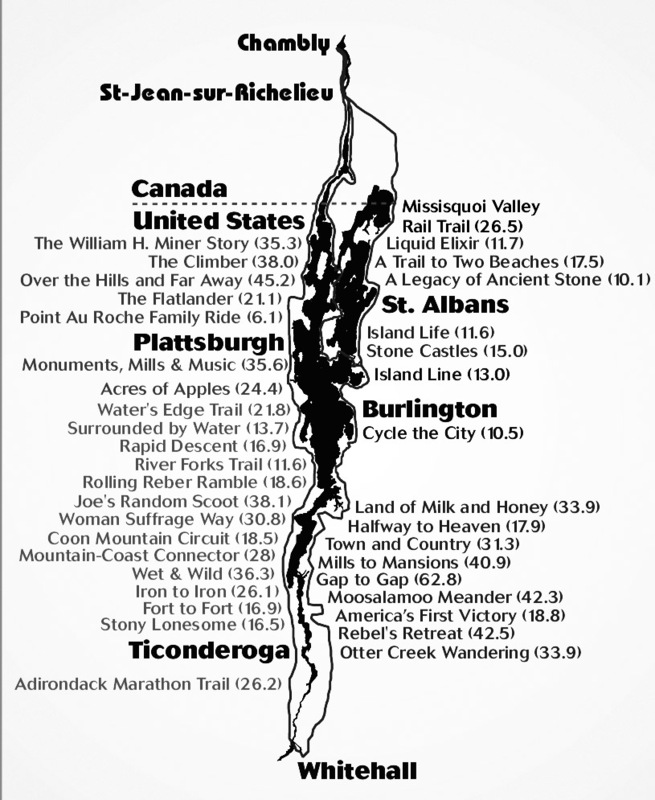 Complete mile-by-mile directions of the 363-mile Champlain Bikeway and 38 shorter connecting theme loops are available by state and province. 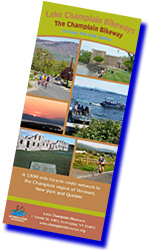 These PDF Resource materials including maps, descriptions and mileages were developed through a partnership among Lake Champlain Bikeways, Northwest Regional Planning Commission, the Islands and Farms Regional Marketing Program, Vermont Department of Forests, Parks and Recreation, Lake Champlain Byways Council, Lake Champlain Islands Chamber of Commerce, and local bike enthusiasts.